Plumbnorth provides a comprehensive service for all hot water tempering devices. We are licenced to install and service all thermostatic mixing valves, tempering valves and electronically controlled hot water metering devices. 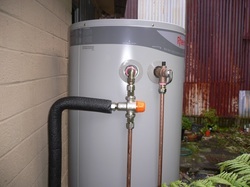 Don't allow your property to represent a risk of hot water burns. Call Plumbnorth on 0411 748 650 for a comprehensive check on your thermostatic mixing valves today.